Big Government posted an "Open Thread" article on their website Sunday regarding government shutdown and their support of a repeat. Today, in 1995, the Federal Government began a partial shutdown of non-essential services. While most of the American public barely noticed this, the GOP, unfortunately, quickly blinked. Hopefully, we won’t make the same mistake again. I thought this brief post was interesting. Big Government's editorial board believes the government shutdown was a good thing. I thought it would be good to take a look at some of the results of the shutdown, as detailed by the Congressional Research Service. Health. New patients were not accepted into clinical research at the National Institutes of Health (NIH) Clinical Center; the Centers for Disease Control and Prevention ceased disease surveillance (information about the spread of diseases, such as AIDS and flu, were unavailable); hotline calls to NIH concerning diseases were not answered; and toxic waste clean-up work at 609 sites stopped, resulting in 2,400 “Superfund” workers being sent home. Federal Contractors. Of $18 billion in Washington area contracts, $3.7 billion (over 20%) were managed by agencies affected by the funding lapse;10 the National Institute of Standards, was unable to issue a new standard for lights and lamps, scheduled to be effective January 1, 1996; and employees of federal contractors were furloughed without pay. So let's see - the shutdown stopped aid to veterans, cut assistance for basic needs for Native Americans, and caused millions in losses to American industries. 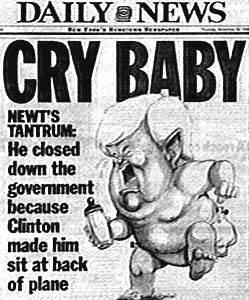 "He told a room full of reporters that he forced the shutdown because Clinton had rudely made him and Bob Dole sit at the back of Air Force One... Newt had been careless to say such a thing, and now the whole moral tone of the shutdown had been lost. What had been a noble battle for fiscal sanity began to look like the tirade of a spoiled child. The revolution, I can tell you, was never the same." Now look at this new batch of Republicans coming in who want to shut down the government because they believe Obama wants them to "go to the back of the bus." Well, Democrats overplayed their hand as a result of the 2008 election and if the Republicans are stupid enough to shut down the government, they will overplay their hand. What the lemmings do not realize is every time there is political turmoil, Rusty the Chickenhawk's ratings go up. So he tries to keep the turmoil going by refusing to compromise and the Republicans have to follow to the "T" everything he says or get teabagged. By the way, I saw you got a lot of attention on Big Government recently! You should have seen the comments on Big Peace. I simply pointed out Caroline Glick had stated in a previous article that none of Israel's neighbors recognized its right to exist. This is incorrect because Israel has signed a peace treaty with Jordan and Egypt. As a result they have full diplomatic relations with both countries. This fact is easily verified, but I was accused of lying, etc. Next time you will have to join in. They really are not much of a challenge. I am getting board except I enjoy pointing out the flaming comments I constantly receive. I try to join in but sometimes I don't visit for a couple days and I'm too late on the conversation! Kevin, it was early in the morning. Would you please change board to bored. Thank you. You need to go to Big Peace. There is an article on the Muslims and some of them are simply stating nuke them until they glow. Spelling error forgiven! I don't have the power to change your comment but I understood where you were coming from. For some reason, when I'm tired I spell "subtle" as "suddle!"